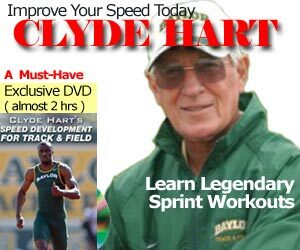 Why Do You Hear the Gun AFTER the Sprinters Leave the Blocks? 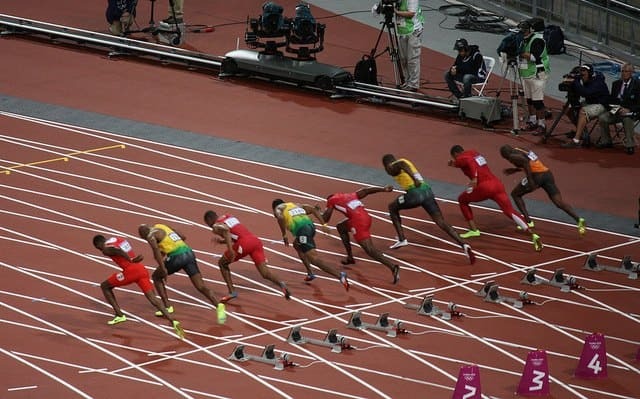 Why do we hear the pistol after the athletes are off their blocks? If a traditional starting gun is used to start the athletes, you appear to hear the pistol shortly after they seem to leave their blocks. It appears almost as if all of the competitors are off to a false start! A similar effect of sound and contact is perceived by those watching a baseball game. The ball appears to make contact with the bat shortly before they hear this happening. What is causing this phenomenon and can we quantify it with actual numbers? The culprit turns out to be the immense speed with which light travels. Light holds the universe record for speed, as, according to Einstein’s theory of relativity, its speed of 300,000 km/s (when travelling in a vacuum). It cannot be surpassed by anything else. Sound waves, on the other hand, may travel fast by human standards, but their speed of 340 m/s (in air) cannot compete with that of light. Let us use this information to explain what is happening to the confused spectators. Assume that they are sitting at a distance of 100 metres from the pistol. Light travels so fast that the image of the athletes leaving their blocks reaches the spectators’ eyes almost instantly. On the other hand, as sound travels about 340 metres in one second, it will take almost a third of a second to reach the spectators’ ears. So, it is this third of a second (that would be longer for those watching from further away) that causes the confusion. It is essentially the same reason that we hear thunder after we see the lightning associated with it. READ Remember when 9.79 was the Holy Grail of the 100m Sprint? In the time it takes Usain Bolt to complete the 100m dash, light has travelled to the moon and back four times. ThisBolt’s performance may sound impressive but so are the dimensions of the universe. For a light emitted from the Pole Star, Polaris, the most famous star of them all, to reach us, it will take more than 400 years. When we gaze at the stars, we are in some sense gazing into the past. In my latest book, Every Night Astronomy: From Ancient Calendars to Harvest Moons , I look into this and other interesting facts about the night sky. If you enjoy speed then the motions of planets, stars, and light itself, are sure to impress you! What is more, 50% of my net profits will be donated to the organisation Astronomers Without Borders, that amongst other things, promotes astronomy in developing countries. That is why when you hand time, you start the stopwatch from the smoke of the gun, and not the sound of the gun. Dr. Vassilios McInnes Spathopoulos graduated from the University of Glasgow (UK), with a joint honours degree in Aerospace and Electronic Engineering, in 1995. The following year he completed a MSc course in Flight Dynamics at Cranfield University (UK). In 2001 he obtained his PhD from the University of Glasgow, conducting research on the validation of a rotorcraft mathematical model by means of flight testing a gyroplane. His research interests include the aerodynamics of sports balls and improving engineering education.